Here’s an easy recipe for family, party favors and other gifting, developed by Deborah of Taste And Tell Blog. And, it’s done in 22 minutes: Prep time is 10 minutes, cook time is 12 minutes. If you’re wary of fudge because it has “too much sugar,” the solution is simple: Cut the squares to half the size. You don’t really need a two-inch square: a one-inch square is fine. We even cut them into half-inch squares and served one or two pieces on the saucer of an espresso or coffee cup. You can also thread the fudge squares on fruit skewers. 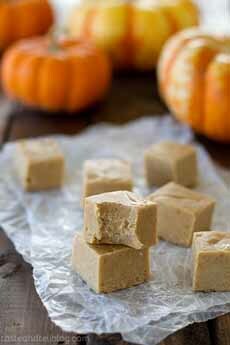 Cut pumpkin fudge into small squares for a holiday treat (recipe and photo courtesy Taste And Tell Blog). 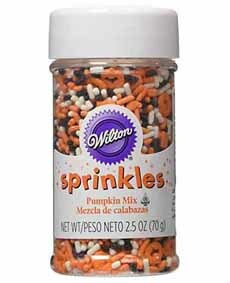 Seasonal-colored sprinkles work for either holiday (photo courtesy Wilton). 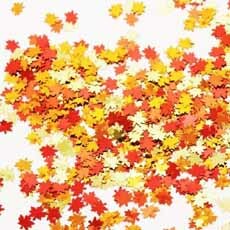 Fall leaves edible confetti (photo courtesy Creative Converting). 1. LINE an 8 x 8-inch baking pan with foil and spray with nonstick cooking spray. 2. COMBINE the sugar, evaporated milk, pumpkin, butter, salt and pumpkin pie spice in a medium saucepan. Heat over medium to a boil; allow the mixture to boil for 12 minutes, stirring often. 3. REMOVE from the heat and stir in the white chocolate chips and marshmallows. Stir in the vanilla. 4. POUR into the baking pan and chill until set. Cut into squares. 5. TO STORE: Layer the pieces on wax paper, then place in an airtight container. A sealable plastic bag works as an airtight container, but to keep it horizontal and flat, place a piece of cardboard on the bottom.